Most of us don’t think about eating oysters during the holidays, or for that matter in winter at all. But here in the Northeast, specifically on the East End of Long Island, oysters are currently at their tastiest. From late November to mid-January, these delicacies are both large and plump – allowing for additional preparation methods. It’s hard to compete with the fresh sea taste of a raw oyster, but the cold winter weather often demands hot food this time of year. 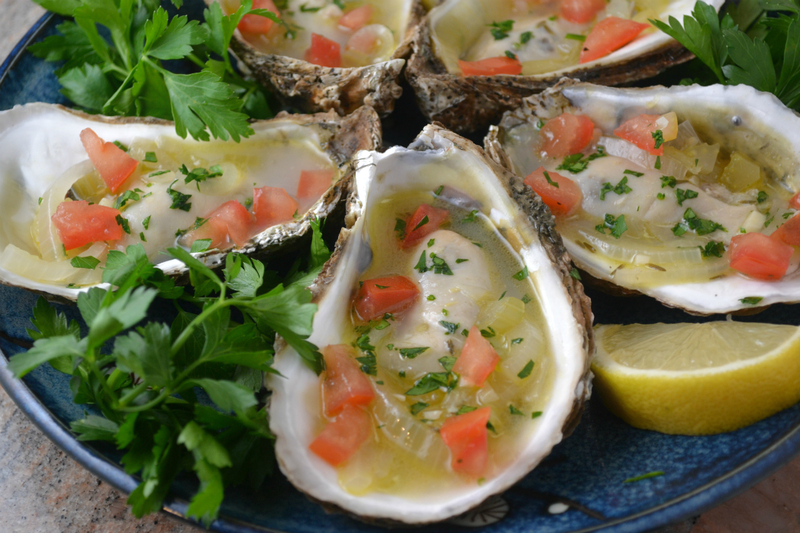 This unpublished recipe for Oysters in White Wine sauce by my grandmother, Paula Peck, is the perfect compromise of a warm comforting dish that still has the fresh flavor of oysters pulled from the water that same day. My grandmother and her close friend, James Beard, shared similar views regarding fish and seafood. She insisted that fish and seafood must always be fresh and never overcooked – now standard culinary rules that weren’t as common back in the 1960’s. Although she demanded high quality seafood (usually from Citerella in those days), it’s unlikely she ever got to enjoy the level of freshness that the bays of Eastern Long Island can provide. 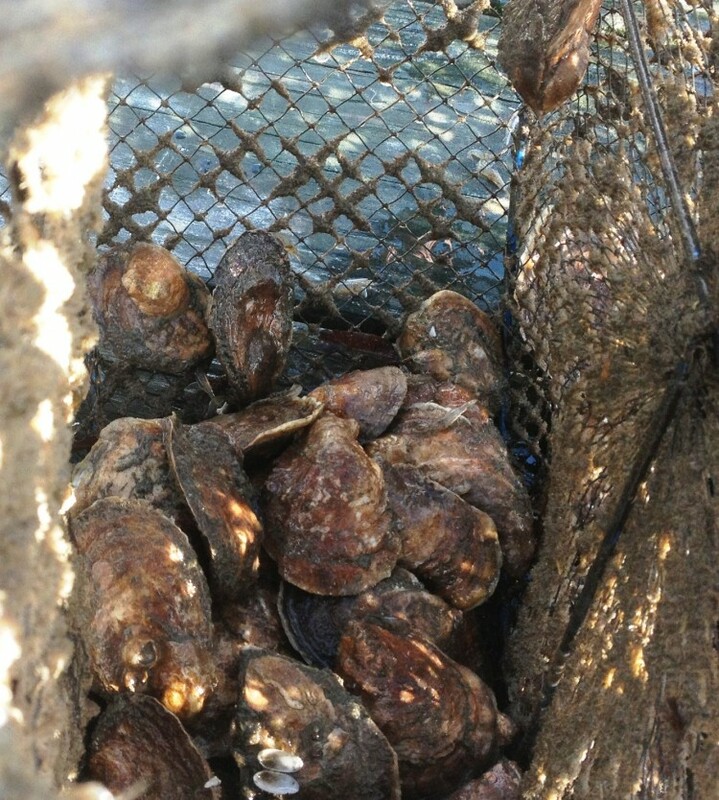 With my father working with the Southold Project in Aquaculture Training (SPAT) – a Cornell Cooperative Extension Program in Southold to revitalize the shellfish of Long Island, I’m often spoiled by the superior quality of the oysters I eat when visiting. These amazing mollusks bulk up over the summer in preparation for winter hibernation (and for us to eat them! ), making them an excellent candidate for this soup-like dish. Vegetables and herbs are combined with white wine, lemon juice, and olive oil then simmered for an hour until slightly thickened and fragrant. 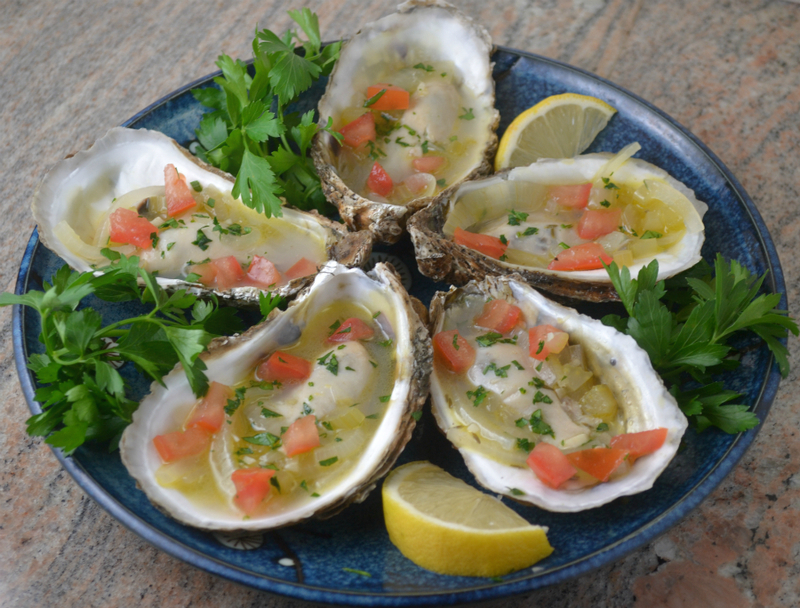 The shelled (fat) oysters are then simply added with all of their juices and quickly poached until just barely tender. The cooked oysters can then be served back in their shells, making Oysters in White Wine Sauce the perfect appetizer for one of my grandmother’s famous dinner parties for James Beard and Craig Claiborne, as well as your next holiday party. Combine all ingredients except oysters, salt, chopped parsley, and tomato in a deep heavy saucepan. Bring to a boil. Lower heat, cover, and simmer for one hour. Add oysters and their juice. When liquid begins to simmer around edges of pot, turn off heat (no more than 4-5 minutes). Season with salt to taste. To serve, remove each oyster with slotted spoon into reserved shells (or small bowls). Spoon some of the sauce and vegetables into shells. Sprinkle with diced tomato and chopped parley. Garnish with slices of lemon.